First things first: Micha et al have been doing a great job of addressing the issues I had raised over the last coupla days. Most of them have been dealt with, and apparently there'll be a new drop of the beta released today. And the fixes are already in source control for those that like doing their own builds. That's impressive. I've also taken them to task slightly over inaccuracy of the beta release docs, as it's wasted a bit of my time, which I don't appreciate. Micha said he's taken that criticism onboard, which is cool (esp as I was pretty blunt about it). Let's see how that goes. 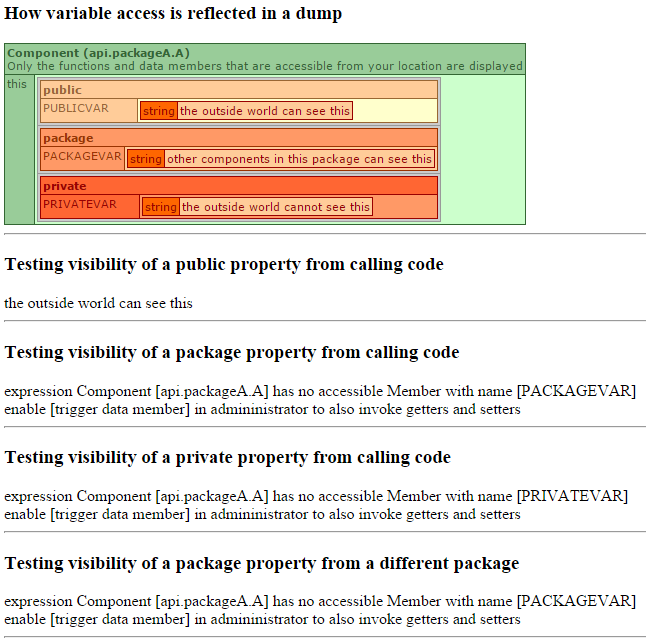 public this.publicVar = "the outside world can see this"
private this.privateVar = "the outside world cannot see this"
package this.packageVar = "other components in this package can see this"
This file just sets some variables with the various different access modifiers. Other files in the test will access these. So this tries to access a package-access variable from a different package. We'd expect this to fail. And this tries to access a package-access variable from the same package. We'd expect this to be OK. The runsafe() function just tidies up the code a bit, so I don't have a whole bunch of try/catch code everywhere. I've not much else to say on this: it's a fairly minor feature. Good work, Lucee Team. Once this new release is out, I'll revisit the static and abstract stuff to provide some working examples. Hopefully I'll be able to do that this evening.